Besan kadhi recipe is a basically yogurt (curd - dahi) and besan (chana dal/ chickpea flour) recipe. You could call it a yogurt curry too. Apart from this kadhi recipe which is made in the north and western states of India, there are some variations in south Indian recipes known as mor kulambu (Tamilnadu), majjige huli (Karnataka). Kadhi recipe is made thick or thin according to your choice. You can serve it with rice, chapatti / roti or moong dal khichadi or serve it as a hot drink along with a meal. Chickpea flour is used to give the desired consistency to the kadhi and also to prevent the curd from splitting when heated. 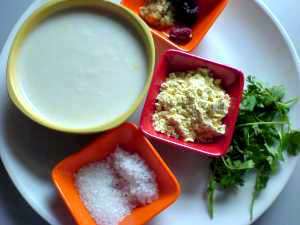 You may use plain curd (plain yogurt) or buttermilk to make kadhi. Add more or less water according to need. The sourness of the kadhi is of personal choice. Use fresh curd or buttermilk if you do not want it to be sour. Generally, a little sourness is preferred. Sugar - 1 tsp - more or less according to taste or to balance the sourness of the yogurt. Add besan and yogurt in a bowl. Mix well to form a lumpless batter. Add sugar, salt, garlic (if adding) and ginger, turmeric powder. Mix well. In a deep pan, heat oil or ghee. Add mustard and cumin seeds. When they stop crackling, add hing, chopped green chili and curry leaves. Fry for a few seconds. Add the curd / besan mixture. Keep stirring and bring to boil. Reduce flame and continue boiling for a minute. Kadhi cooks very fast. Once it starts boiling, you need to be careful. Kadhi has a tendency to boil over. So watch. Give the contents a stir when you feel it may boil over. Switch off the stove. Besan kadhi is ready. Serve hot with plain rice, moong dal khichadi or chapatti or as a hot drink. The thickness of the kadhi will depend of what you are planning to serve it with. To serve with rice or by itself, keep it thin. To serve with chapatti, make it thick. Vegetables such as bhindi (okra), cucumber, tomatoes, onion, gourds, drumsticks are added to kadhi. You will first need to cook the vegetables in water before adding to the boiling kadhi. You may also add besan pakodas to kadhi. If you want thicker kadhi, add less water or more besan. Turmeric can be added after curry leaves while cooking seasoning.